My musical taste has several dark areas, where the sounds I am listening to have no interaction at all with my acquired taste. Progressive music in general hit such a dark spot. I am not going to explain myself, nor to defend my opinion, and so upon listening to Indelible’s album, I decided I am going to analyze it from my point of view, standing remote and without the tools to dissect this kind of music. I will tell what I hear and attempt to dress “Remnants in Red” on my own musical perspective. I have done this with the Contemporary Noise Sextet review, and another opportunity is presenting itself in here. The members of Indelible – Robert Osgood, Mona Sjøli, Marius Sjøli and Jason Walton, are building an extensive storyline in “Remnants in Red”. The introduction section opens a lot of curious questions about the album. A lonely piano is telling its tale, and I am fascinated by a strange sound that appears on several points of the track, sounding like an obscure mix between a rusty door being opened, and a failed attempt to speak. This sound, tiny as it is, grasps my attention completely and I am drawn inside now. “Mundane Monotony” is another song I like, this time for the pain that is delivered with every time the Mona Sjøli is singing “Oblivion!” . This is one of my favorite songs from the album, although on the rest of the album you can find a great element that is almost missing from this song, and it’s the great drumming, that sounds powerful even when diminished by the rest of the music. An example for this drumming can be found later on the title track – “Remnants in Red”, for instance. 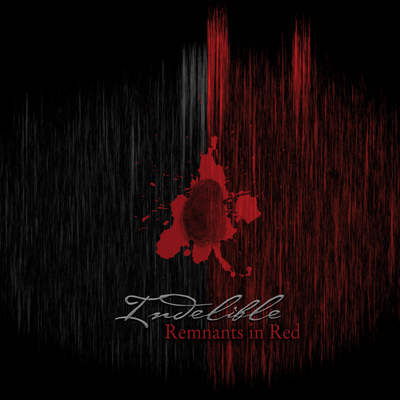 Indelible flows through “Remnants in Red” with painful words, wailing guitars and highly dynamic music. The production sounds highly professional, and when “The Void” ends, you get the satisfying feeling you have been listening to a whole album, instead of a collection of songs, and that Indelible are really good in what they are doing.